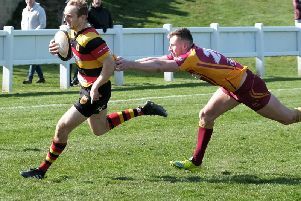 Harrogate RUFC are attempting to raise £70,000 in the next two months in a bid to secure a 999-year lease of their ground at Rudding Lane. If the club can generate sufficient cash by April 25 they will become freeholders of the land, leaving them in a much stronger position to move forwards both on and off the pitch. “We are looking to build for a better future and secure a home forever,” said Dave Doherty, ‘Gate’s commercial director and director of rugby. The Cockerels currently owe a debt of around £100,000 to property developer Crest from an overspend during the building of their Rudding Lane clubhouse. The sum is set to be re-paid over the next four years, but by clearing the monies owed before the end of April, the club will save themselves £30,000 in interest payments. They will also then be in a position to apply to the Rugby Football Union for funding, something which Doherty believes will be crucial to the club improving its facilities in the future. “We need to have freehold of our ground in order for the RFU to invest in us and us to be eligible for grants,” he added. “With 530 youngsters playing here, we are the second biggest club in the North of England in terms of our junior membership. “With this in mind, we need to improve and develop our facilities to cope with the demand. More pitches, 4G pitches and additional car parking are all required. ‘Gate plan to raise the funds needed by selling lifetime and five-year membership packages at a cost of £2,500 and £1,000 respectively, as well as offering the naming rights to their ground to a local company and business. With more than £25,000 already pledged since commercial chairman Mike Cowling presented the club’s plans to members at a meeting last week, Doherty is confident that their target of £70,000 is attainable. “I’m confident that we can do it,” he continued. “The good thing about the membership packages is that they are a way that supporters of the club can do their bit to directly help us build for a better future. “I’m also hopeful that having the naming rights to the ground will appeal to a business, preferably in the local area, that wants to become identifiable as a partner of Harrogate RUFC.